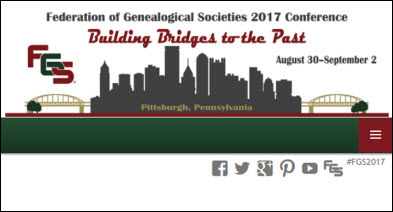 This week, hundreds of genealogists are descending on Pittsburgh for the 2017 conference of the Federation of Genealogical Societies. It gets underway Wednesday with Society Day plus an evening social event (what could be better than a boat ride onboard the Gateway Clipper Empress for a dinner cruise along Pittsburgh’s three rivers?). And there will be plenty of sessions during the conference on The Legal Genealogist‘s favorite topics: law, genealogical ethics, and cool record sets we wouldn’t have but for the law. Plain Spoken: Updating and Simplifying Your Society Bylaws, session W-113 at 11 a.m., and then, at 3:30 p.m., Jane Haldeman presents Oh, Those Pesky Minutes and Motions in session W-128. What are the hidden messages of government abbreviations, notations, and bureaucracy in pension files? Understanding the documents, the pension process, and processing information will squeeze the most out of a military pension file. If paying taxes is not your favorite pastime, then your ancestors may have avoided taxes as well. Learn to use their delay in paying as a tool to finding those pesky family members. Tax records can tell us much more than about property. Many bounty land records rival pension records in their value. Find these records and locate bounty land, including state bounty land. Explore the records using new online tools. Understanding the records of the courts closest to the average citizen is crucial to finding clues to family history in Pennsylvania and beyond. Learn to navigate successfully through original Pennsylvania courthouse records and their special indexes, only some of which are online. Learn to find letters and requests to presidents, governors, or other governmental officers for your ancestors. Case studies will be presented along with hands-on activities. Slavery’s force was felt far north of the Mason-Dixon Line, and the Black Laws of northern states created valuable records for tracing African American families. Genealogists can make a difference. Learn the steps taken by PAHR beginning in 2007 that made death records available after 50 years and available online begining in 2014. Learn about federal records at NARA, Bureau of Land Management, and the Library of Congress that present a picture of development, traffic, and travel on rivers and canals. Learn how to research and analyze apprentice records for children of color. Learn about the wide variety of state land records held by the Pennsylvania State Archives. This presentation will introduce the patenting process and documents it created, as well as how to navigate and use the records available online. This session will give an understanding and overview of New England probate and deed research. Death certificates are vitally important for learning ages, places of death, places of birth, women’s maiden names, military service, etc. Researchers need the skills to analyze the records and know what will lead to additional sources.